Spurious reprints by Artur Virgilio Alves dos Reis rivaled legitimate ones printed by the Portuguese government. Confidential missions, forgery, miscommunication and international money scams? Am I describing the plot points to a movie or the most successful paper money scam of all time? Surprisingly, it's the latter. If you're a paper money collector, then there is no doubt that you've heard of the Portugal Bank Note Affair of 1925. The story goes as such: Led by Artur Virgilio Alves dos Reis, a group of people nearly wrecked the Portuguese economy by spuriously printing over 100 million escudos in 500 Escudo notes and introducing them into general circulation. … notes that were printed for this scam were, in fact, genuine 500 Escudo notes; and by the end of the heist, there were nearly as many officially issued 500 Escudo notes as there were bogus reprints. In today's technological age, it's hard to imagine a time when a heist such as this would have worked. The plot relied heavily on a lack of communication between the real bank officials and the printer, as well as a general air of secrecy surrounding the whole "mission." After making many small real estate and retail investments, Reis and his accomplices opened a bank, Banco de Angola e Metrópole, to aid in the laundering of the unauthorized bills. Ultimately, this bank drew a lot of attention for being able to issue low interest loans with little or no deposits. Over time, the officials caught on but couldn't pin down Reis or his crew with any hard evidence. It was the duplicate serial numbers, noticed by chance, that finally busted the operation in December of 1925. 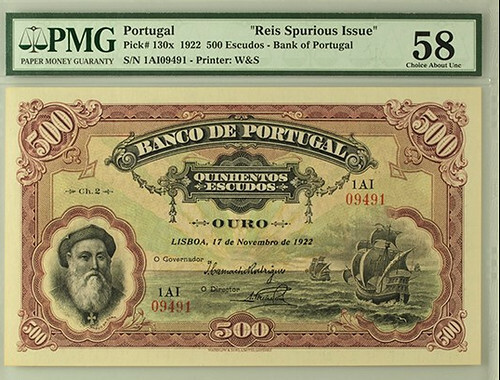 If you are interested in finding a little piece of Portuguese history, PMG officially recognizes Reis's spuriously printed notes in our population, under Portugal 130x. To identify a Reis reprint from a genuinely issued 500 Escudo note, look for serial number prefixes with double vowels (e.g. AA, AE, AI...) or prefixes above "AN." Expect to pay a pretty penny for this note, however, as a Reis reprint (graded by PMG in AU58) sold through Heritage Auctions in 2016 for over $7,500.